National Geographic globes present an enhanced view of the world by expert cartography, proprietary fonts and rich detail. These beautiful globes are carefully researched by National Geographic’s cartographers and editors, ensuring the utmost accuracy, making them an excellent reference tool. 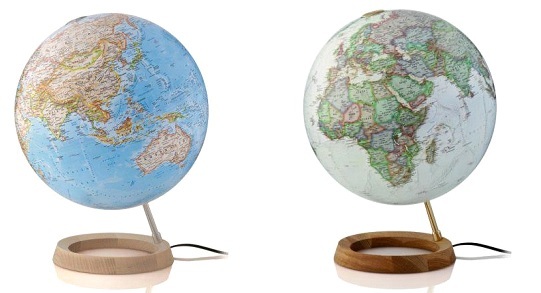 Craenen bvba will stock these globes in three languages: DUTCH, FRENCH and ENGLISH. The Carbon globe is one of the latest series of globes to feature National Geographic cartography. Over 2,000 place names are included. The text is clear and each country is given a different color with a darker tone around the borders to accentuate the political mapping. In the oceans, undersea trenches and basins are named with arrows indicating major ocean currents. A clever use of shading in the oceans gives a stunning effect when the globe is illuminated. The globe has a diameter of 30 cm and is 40 cm high. The Carbon globe features a hard transparant plastic meridian and a black scratch-resistant base that houses a metal weight for added stability. This Carbon series is available in two types: the "Classic" or "Blue" globe (with blue oceans) and the "Executive" (antique view). These globes can be illuminated. This blue ocean National Geographic globe features over 3800 place names. The text is clear and each country is in a different colour with a darker tone around the borders to accentuate the political mapping. Undersea trenches and basins are named in the oceans, with arrows indicating major ocean currents. Shading is used to represent ocean depths. This illuminated globe has a grey, hard plastic meridian and base. 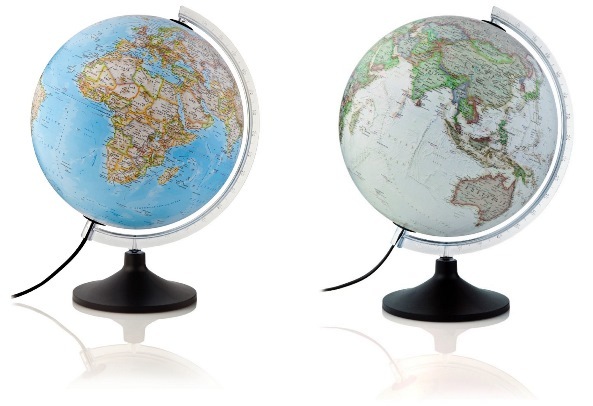 This nice globe shows a bright cartography with clear country borders and shaded relief mapping. The globe has a diameter of 30 cm, is 40 cm high and has a die-cast metal meridian with grading and a turned solid wooden base. 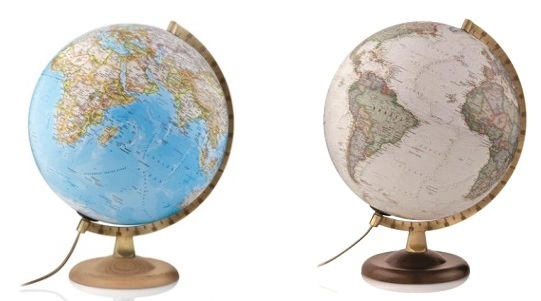 The National Geographic Gold globe is available in two types: Classic with a clear blue ocean and a beech nut base and Executive (antique view) with a walnut base. These globes can be illuminated. The "Neon" series also has a bright cartography with clear country borders and a shaded relief mapping. This globe has a diameter of 30 cm and is 37 cm high, without meridian. The Neon Blue globe (Classic) has a solid maple base turned from a single piece of wood together with brass stem and fittings, ensuring that this traditional globe will enhance any room or office setting. The Neon Executive globe (antique view) has a solid oak base turned from a single piece of wood together with brass stem and fittings, adding the final touches of luxury and elegance to this fine globe. These globes can be illuminated. The Iron illuminated globe shows a clear text and each country is given a different color with a darker tone around the borders to accentuate the political mapping. Over 2,000 place names are included. In the oceans, undersea ridges and basins are named and the clever use of shading gives a stunning effect when the globe is illuminated. The Iron Executive (antique view) or Blue (classic) illuminated globe has a rare combination of a highly detailed globe (30 cm diameter) and luxuriously minimalist style. 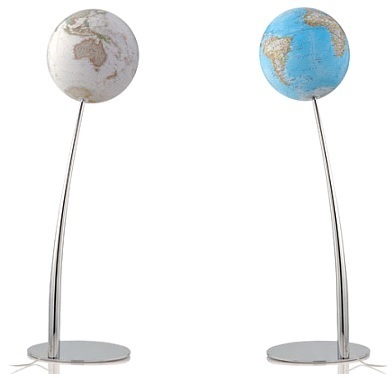 Mounted atop a chromed steel stem and solid chromed steel base with discreet, foot-operated switch, this globe is sure to be the centre of attention in any contemporary room or office setting. Total height: 110 cm.